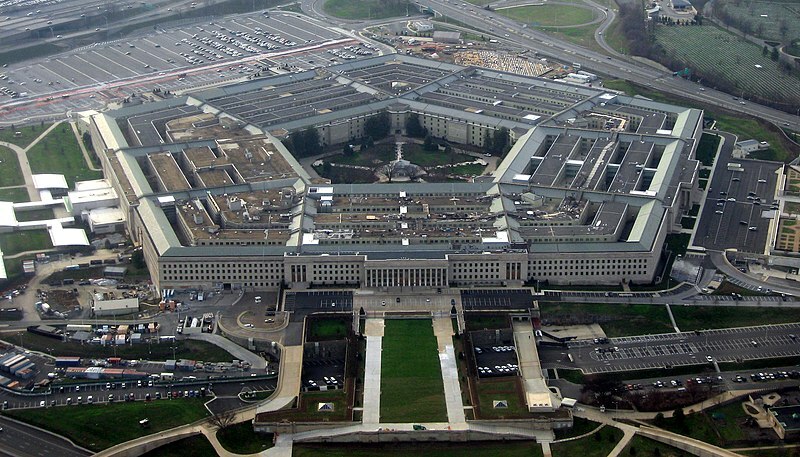 The Pentagon above ground…merely the tip of the iceberg? If you’re wondering how the previously mentioned Splinter Civilization with all its suppressed technologies, manpower and equipment could exist without the mass public’s knowledge then consider what’s below the surface. Literally. That’s right folks, we’re talking about the hidden black world beneath our feet – another favorite theory of a million and one members of the Tinfoil Hat Network, but also a theory many genuine researchers buy into as well. 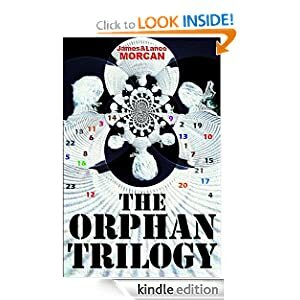 In our international thriller series – you guessed it, The Orphan Trilogy – the shadowy Omega Agency’s secret headquarters are one mile below ground. This decision for the storyline was inspired by longstanding rumors of military bunkers and enormous underground facilities not known to the general public. That comment got us thinking. What the hell are the powers-that-be doing below ground and why are they building such facilities? In the course of researching this particular book, we came across a number of convincing sources that appear to confirm the existence of at least some secret subterranean facilities. These sources include declassified US Government files, university reports, Wikileaks’ documents and eyewitness accounts from common citizens who stumbled across such bases, as well as interviews with, and testimonials from, former military personnel who claim to have worked in underground bunkers. Like most theories covered in this book, we still don’t necessarily have any definitive answers to offer. That’s the nature of conspiracy theories, folks. Nevertheless, sifting through the myriad of reports, whispers and rumors of underground facilities sure was enlightening, sobering and fun all at the same time! Remember in chapter 7 we covered examples of suppressed science – like Nikola Tesla’s technologies and other little-known inventions that we suggested the Splinter Civilization may have in their possession? Well, if we are correct and a more scientifically advanced offshoot of humanity co-exists on the planet right now, then it’s a safe bet they maintain their secrecy by going about most of their business in underground bases. And not only in America, but most likely all over the world. Classified: A Deep Underground Military Base…somewhere in America. Where else short of colonizing another planet could they hide the required plant, machinery and equipment – and the manpower to operate it – away from the prying eyes of Joe Citizen, investigative journalists and inquisitive everyday people like us? Worth noting is that security at the entrances to known and acknowledged underground facilities is at least equal to security at the border checkpoints that separate nations. This seems to add some weight to the theory that we are dealing with a Splinter Civilization and this small but powerful group have purposefully divided themselves from official society, or from the world as we know it. More correctly, the global elite have separated us from their society because they’re able to operate in both worlds – above and below ground. According to our research, this Splinter Civilization was able to grow so powerful and remain largely below the radar due to a number of complex events, which all intersected mid to late last century. One was the apparent arrival of extra-terrestrials en masse, allegedly commencing around the time of the widely reported yet still classified Roswell UFO incident in New Mexico in 1947. Another was the scientific improvements in tunnelling and digging technologies from the 1950’s onwards. Again, one of us (Lance) can speak with a little authority on this, having gone through the Mount Isa Mines school of mining in the Outback of Queensland, Australia, working as an underground miner back in the late 1960’s and following mining developments around the world with interest ever since. 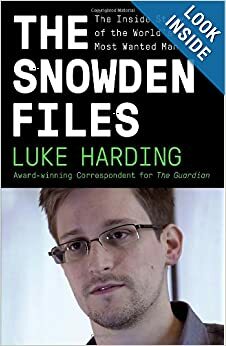 The third reason was the Cold War whose ‘national security’ demands and the resulting unhealthy culture of secrecy it gave rise to encouraged governments to be less accountable to their citizens. These coinciding factors all created a perfect storm for underground bases to be built and managed by the Military Industrial Complex and intelligence agencies as well as private corporations. Those who have researched unacknowledged subterranean facilitiesare almost unanimous in their belief that the bases are funded by black budgets financed by a combination of banksters, drug wars and profits from (mainly mineral) resources plundered from unwitting Third World countries. The US program for building these underground bunkers is known as DUMB, or Deep Underground Military Bases. DUMB has apparently been in operation since the late 1940’s and there are now said to be hundreds of such bases in almost every state in mainland America. In the 21st Century, it’s basically common knowledge and certainly widely accepted that the Pentagon has multiple levels of enormous bunkers and an immense network of tunnels beneath its visible exterior. It makes complete sense, too. You’d expect the Department of Defense’s HQ of the world’s greatest superpower would have multiple access routes and escape tunnels to accommodate sudden evacuations and other emergencies. It’s a similar situation in Washington D.C. where it has been widely reported by mainstream media that there’s a vast tunnel system below the capital. And it’s our understanding that at any given time there are at hundreds of security personnel patrolling the tunnels, on foot or with the aid of motorized vehicles, beneath the city. Very likely many of D.C.’s tunnels lead to and from the White House. The often-told stories of Marilyn Monroe being sneaked in and out of the White House via underground tunnels to meet with JFK would seem to confirm this. Such tales reveal the capital’s extensive tunnel system enabled Marilyn to be the President’s mistress without much scandal – for a period, at least. Tunnels purported to be beneath the White House. “The covert underground infrastructure serves many functions. Among these are strategic storage of materials and weapons, clandestine research and production facilities, alternant basing for military personnel and equipment, surface environment control systems (atmospheric lensing, synthetic earthquakes, weather modification, civilian population control, etc).” –Dr. Steven J. Smith. Excerpt from the paper Underground Infrastructure –The missing forty trillion dollars. By all appearances, the US Government is building underground cities in preparation for a coming catastrophe they seem certain is imminent. Whether the elite believe it will be some kind of nuclear apocalypse or a religious, Armageddon-type scenario, nobody knows. At least, nobody we know knows. In episode 4 of the third season of Conspiracy Theory with Jesse Ventura, former Minnesota Governor Ventura and his son Tyrel Ventura, along with Sean Stone, son of Oscar-winning filmmaker Oliver Stone, travel to the Ozarks, a mountainous region of the central United States, to investigate rumors of underground developments there. They find the entrance to what appears to be an underground city being built inside a mountain. “It’s like they’ve got door-to-door transportation for the chosen few when it’s time to move inside and weld those doors shut. I don’t necessarily think it’d be a good place to live, but it would be a good place to survive.” –Jesse Ventura, from episode 4, season 3, of Conspiracy Theory with Jesse Ventura. Fair questions, but keep in mind we have no strong opinion either way as to whether aliens are with us or even if they exist. All we are doing is repeating the conspiracy theories out there concerning underground bases. It just so happens a lot of rumors and reports – some reliable, some not – on such bases involve either aliens or alien technologies. In many instances, the theories surrounding underground bunkers and aliens cannot be separated. “It is the most well kept ‘secret’ of all time! The earth is a much grander, mysterious and wondrous place than anyone could ever imagine in our wildest dreams! If true, an entire ‘second’ earth exists right below our feet! Not just in the US but nearly every point on this earth hosts an entire network of caverns of vast size and depth; honey-combed thru out the planet! There is a vast and deep underground world where advanced technology can be used freely. Where people can escape to and where all manner of secrets can be kept. Some very important testimonies and documents are available from certain ‘military’ sources (confirming) that this is real!” –ArraiEl (Yahoo member), published on the Yahoo Voices website on 25 October 2011 in an article titled Deep Cavern Systems Worldwide. 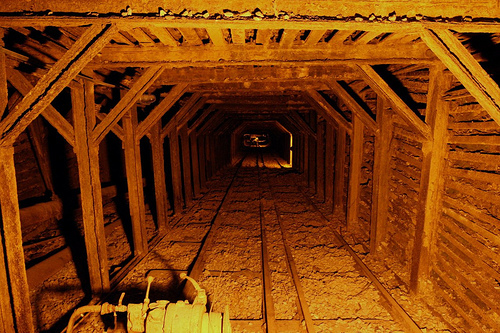 California’s Empire Mine State Historic Park…one of many mine shafts around the world. Many caves, including one nicknamed the Subterranean Grand Canyon, are so vast only their entrances have been explored, while others – it’s universally agreed – have yet to be discovered let alone explored. And many of these giant cave systems contain rare rock formations and unusual geology, significant underground rivers, lakes and seas with unique species of cavefish in them, as well as abundances of gemstones, crystals and gold. The Er Wang Dong cave system, in China, even has its own climate system complete with clouds and rain! Skocjan Caves…better known as the Underground Grand Canyon. The Lechuguilla Cave in New Mexico is another example. Only officially discovered in 1986,Lechuguilla isthe seventh-longest explored cave in the world with 138.3 miles of confirmed cave networks, although more sections of the cave continue to be found. Given the scale of these naturally-occurring subterranean cavities, perhaps the theory of building in, around or on top of such geological systems when constructing underground bases would not only seem prudent, but practical. It’s also worth noting that access to many of the world’s largest caves, including the Lechuguilla Cave, is restricted to approved scientific researchers and government employees. This fact may dovetail with the conspiracy theory that says some of the largest caves are either controlled by the government or lie below completely restricted lands like Nevada’s Area 51, for example. Then again, denying public access to such caves could simply be a matter of safety or conservation concerns, or both. An hour’s drive from Washington D.C. is Mount Weather, a massive underground complex in the state of Virginia. It’s basically a military base within a hollowed-out mountain. 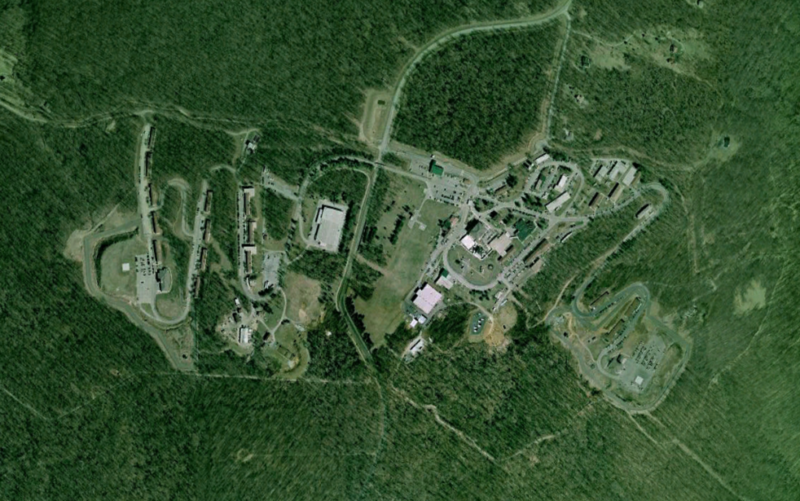 A bird’s eye view of the Mount Weather Special Facility, a FEMA center. As UK newspaper The Guardian reports in an article dated August 28, 2006, the underground emergency operations facility was “originally built to house governmental officials in the event of a full-scale nuclear exchange”. However, with the Cold War over, the article went on to speculate that “as the Bush administration wages its war on terror, Mount Weather is believed to house a ‘shadow government’ made up of senior Washington officials on temporary assignment”. No outsiders have ever been allowed inside Mount Weather, but Richard Pollock, an author and a regular contributor for Progressive Magazine, interviewed several individuals who claimed to have previously been employed on site within the mountain. The interviewees said the base had its own lake with fresh spring water, independent power generation, cafeterias, hydroponic gardens, hospitals and transportation system as well as residential apartments. They also said Mount Weather has its own fire and police departments and, as you can no doubt imagine, its own laws too. Taking the speculation about a shadow government in The Guardian article one step further, Pollock reported the underground facility has its own replica government, which apparently is every bit as comprehensive as the official government above ground. One of the most commonly referred to sites mentioned by underground base researchers is an unconfirmed one said to exist below the small and almost entirely Native American-populated town of Dulce, in New Mexico. There are many stories of government collaborations with aliens in Dulce Base where all manner of exotic research is apparently conducted within its seven or more vast subterranean levels and numerous tunnel offshoots. By all accounts this includes advanced mind control and psychotronic warfare experiments as well as genetic engineering. Some Dulce researchers believe levels 5 and below are occupied entirely by alien personnel and house technologies also alien to this planet. The deepest sections of the underground base are apparently connected to an extensive cave system, which as we’ve mentioned seems to be common theme for most underground bases. Aliens purportedly in residence in Dulce Underground Base in New Mexico. Dulce is believed to have interconnected bases in New Mexico, including the rumored ones at Sandia Base and White Sands, with tunnel systems linking them all. Perhaps tellingly, part of the aforementioned almost 140 mile-long and still not fully discovered cavern system known as The Lechuguilla Cave is said to extend under some of the bases Dulce connects to. Dulce Base first came to the public’s attention in 1979 when New Mexico businessman Paul Bennowitz was convinced he had intercepted communications between antigravity flying machines and underground installations in the area. In the 1980’s, Bennowitz claimed he’d discovered the Dulce Base. 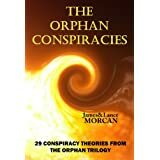 The story spread like wildfire in conspiracy circles and the UFO community in particular. In the 1990’s, US commercial airline pilot John Lear,the son of Lear Jet designer William P. Lear, also claimed he had confirmed the existence of Dulce Base, independently of Bennowitz.However, this is tempered by the writings of political scientist Michael Barkun. The professor emeritus of political science at New York’s Syracuse University believes that Cold War underground missile installations in New Mexico falsely excited ufologists and conspiracy theorists. In Barkun’s opinion there’s nothing else there to support rumors of an underground base at Dulce or rumors of supposed human-alien collaborations. But many Dulce locals, as well as quite a few independent researchers, continue to maintain there is a large site beneath the town. Norio Hayakawa, a New Mexico resident who has independently studied Dulce Base for decades, wrote an article dated March 28, 2007 on the Rense.com website, which detailed his extensive research into the Dulce rumors over the years. Hayawaka implies that Velarde’s choice of words seemed to indicate the Dulce Base was known to the police. Unsurprisingly, Dulce Base has featured regularly in popular culture, including an episode of Conspiracy Theory with Jesse Ventura titled Ancient Aliens,Pittacus Lore’sbestselling young adult book series The Lorien Legacies, an episode of the History Channel program UFO Hunters, the 2012 video game Ghost Recon: Future Soldierand the comic series The Invisibles in which Dulce Base is shown to house a secret vaccine for AIDS. 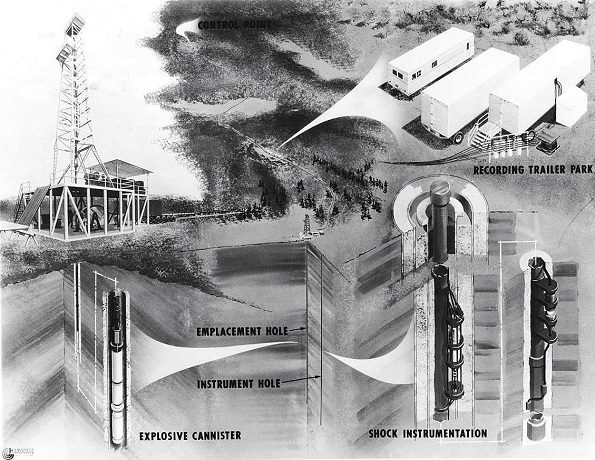 A visual aid to the nuclear fracking process used in Project Gasbuggy. The abandoned Montauk Air Force Station in Camp Hero State Park, Montauk Point, Long Island, NY, has long been the source of many an exotic conspiracy theory, most of which usually involve underground locations. For example, it’s rumored that Paperclip Nazi scientists worked at the mysterious Long Island military facility commonly known as Montauk. The area takes its name from the region’s original inhabitants, the Montauk Indians, who according to the courts no longer exist as a tribe even though remaining Montauk tribal members insist they do still exist. But that’s a whole other conspiracy theory! Many independent researchers have described Montauk as a secret research facility where they claim psy-ops like remote viewing and time travel experiments took place for decades before the site was eventually shut down. Some conspiracy theorists even say there was a more advanced version of the infamousPhiladelphia Experiment conducted at Montauk. You may recall the original experiment allegedly rendered a US Navy vessel invisible to enemy radar and listening devices – a story denied by the US Navy. These top-secret experiments were known as the Montauk Project and were reportedly carried out in nine subterranean levels beneath the abandoned Air Force station. Quite a few Montauk Point locals have reported sightings of high-tech equipment being taken underground, and tunnels and subterranean bases beneath the region have long been rumored within the tightknit community. In the 2010 TV documentary Inside Secret Government Warehouses, produced by the US cable network Syfy, the filmmakers went to Montauk to see if they could confirm the existence of underground facilities. No tunnels or underground facilities were found. However, ground-penetrating radar devices were also used and, although not completely conclusive, they appeared to show evidence of some kind of underground chamber directly below ground – a conclusion confirmed by the independent radar technicians operating the devices. The TV crew also revealed a vast network of tunnels beneath nearby historic resort hotel Montauk Manor. Many commentators believe these tunnels lead directly to the Air Force station and were built as part of the mysterious Montauk Project. 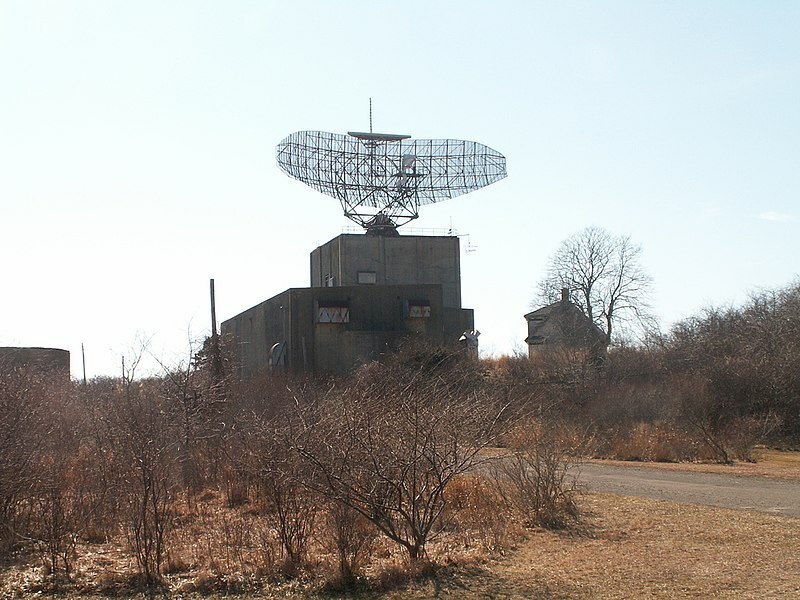 A radar facility in Montauk…a focal point for the Montauk Conspiracy Theory. Cheyenne Mountain is NORAD’s confirmed underground bunker at Colorado Springs, in Colorado. It was developed during the Cold War complete with missile defence systems and advanced space technologies, and is still in operation today. The North American Aerospace Defense Command (NORAD) facility is basically a self-sustained city built inside the mountain. Some conspiracy theorists say tunnels extend from Cheyenne Mountain to other underground bases around the nation including Denver and Dulce Base. Denver International Airport (DIA) is said to have an underground base concealed directly below its tarmac. Around the airport there are numerous fenced-in areas covered in barbed wire. To our eyes at least this seems a tad unusual even for an international airport. What’s also strange about DIA is there are Masonic symbols everywhere and freaky artwork depicting cities ablaze, women in coffins and dead babies adorning the airport’s walls. One of the many bizarre murals at Denver International Airport. Supposedly, there’s also an underground base below the town of Kokomo, Indiana. For over a decade, Kokomo locals have reported hearing a hum coming from below ground – a hum that’s so extreme some have become sick. It has even forced some residents to leave town. Following numerous complaints, the mysterious humming sound has been formally investigated, but investigations have not revealed a likely cause. After living with the problem for many years and sharing information on the grapevine, many Kokomo locals now believe the hum is actually vibrations caused by machinery operating far below ground. This tallies with the beliefs of independent underground base researchers who insist large-scale subterranean excavations and tunnelling are occurring beneath Kokomo. 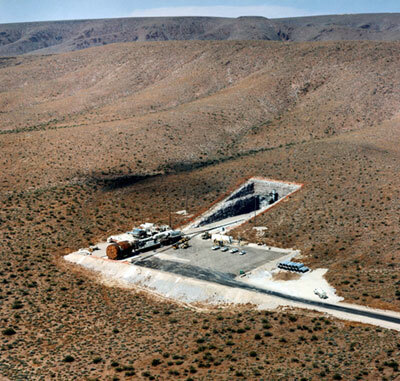 Many have also claimed there’s a vast underground complex beneath Area 51, in Nevada, and that it also contains (perhaps literally) out-of-this-world technologies. (See chapter 29 for a detailed analysis of Area 51). “Since the early 1960’s, the American citizenry have been the unwitting victims of government fraud, perpetrated on a scale so vast that it staggers the imagination … The total amount exceeds 40 trillion dollars … The government has built an entirely new underground civilization … In this new society, there is no poverty, no crime or illicit drug use. In this new society, healthcare is affordable, energy is free, public transport is efficient. And you, the American tax payer have paid for it all.” –Dr. Steven J. Smith. Excerpt from the paper Underground Infrastructure –The missing forty trillion dollars. Mezhgorye is an enormous underground military facility in Russia’s Ural Mountains, close to the city of Mezhgorye. The sprawling subterranean facility apparently required more than 10,000 workers to build it and spans over 400 miles! The military site has never been acknowledged by the Russian Government, or by the Soviet one before it. However, America received intelligence confirming its existence in 1992, according to an article The New York Times ran in 1996. 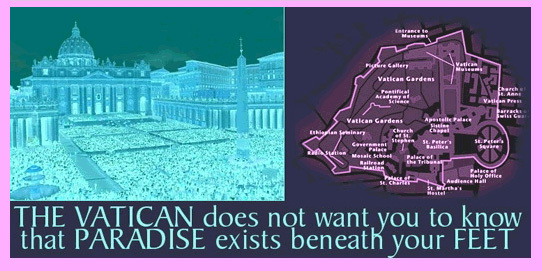 Some underground researchers believe the Vatican also holds subterranean secrets. And we’re not speaking of the known basement areas like the Vatican empire’s Necropolis or the Secret Archives,but rather an ancient network of tunnels, chambers and mysterious buildings miles beneath it. Down in the hidden bowels of the sovereign Catholic state, bizarre ceremonies are said to be performed by Vatican cardinals, bishops and priests. Ceremonies which have nothing to do with Catholicism and everything to do with the religions of ancient Egypt and Babylon. But that, too, is a whole other conspiracy theory and something probably best left to bestselling author Dan Brown. The mother of all underground bases may actually exist in the Southern Hemisphere. In the heart of Australia, the underground facility known as Pine Gap is known about, yet not known about. Officially a joint defence and satellite tracking station, it has been reported by local media that nobody in the Australian Federal Parliament, not even the Prime Minister, has any meaningful information about the US-run base. Local Outback residents have reported seeing massive quantities of food and supplies being delivered for what could be an enormous city below ground. Apparently Pine Gap was constructed on top of the deepest drilling hole in Australia and is about five miles deep. One of the most out-there, yet hard-to-dismiss testimonials supporting the existence of underground bases and the rumored ET’s some of them hide, is that of American Philip Schneider (1947-1996).Although very few records exist on the man and his military career, Schneider stated he was a geologist and former government military engineer. More controversially, he also claimed to have been involved in a firefight that broke out with Extra-terrestrials while he was building additions to the underground military base at Dulce, New Mexico, in 1979. Schneider said he was one of only three survivors in the humans vs. aliens battle in which 66 US Delta Force soldiers were killed. Although Schneider survived, he had severe flesh wounds and burns to his entire body – wounds he claimed were the result of some kind of radiation weapon the ET’s fired at him. 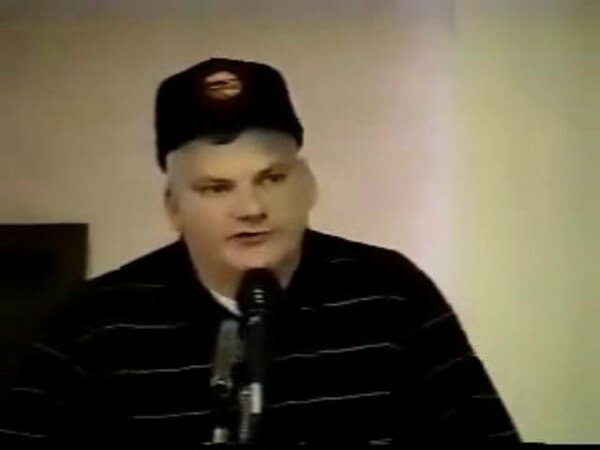 Philip Schneider testified to the existence of underground bases. During another lecture, Schneider mentioned how in 1954 the Eisenhower administration disregarded the Constitution by signing a treaty with the ET’s.The treaty was apparently named The 1954 Greada Treaty. In the same lecture, he mentioned a human-looking alien who was “one of the aliens who has been working for the Pentagon for the last 58 years.” He then produced a photograph of this supposed alien and showed it to the audience and the cameraman filming the lecture. Providing a possible insight into the Splinter Civilization’s monetary resources, Schneider claimed that since 1940’s the US Government had spent almost one quadrillion dollars building hundreds of underground bases all over America. In the course of delivering these lectures – some of which were filmed and are available for anyone to see on the Internet – Schneider displayed visible injuries, including missing fingers and chest wounds, which he claimed were a legacy of the battle with the ET’s. To back up his statements, Schneider also produced what he claimed were classified photographs, ancient alien fossils and non-Earth metal ores retrieved from Dulce Base. Schneider was found dead in his apartment in Wilsonville, Oregon, on January 17, 1996, several days after he’d died. As with everything else in Schneider’s life, his death was also shrouded in mystery. Initially, the Clackamas County Coroner’s office said he’d died of either a stroke or a heart attack. Then they changed their story to suicide. It’s also worth noting that all the geologist’s documents relating to underground bases, as well as the alleged alien artifacts that he’d begun showing to audiences, went missing and have never been seen since. Cynthia Drayer, Schneider’s ex-wife, is one of many who firmly believe Schneider was murdered to prevent him from leaking anything more about the ET-human interactions occurring below ground. An interesting footnote to Philip Schneider’s life is that he claimed his father, Oscar Schneider, revealed to him on his deathbed that he was not the German Jewish immigrant he’d always proclaimed to be, but was actually an ex-Nazi. Schneider’s father also apparently revealed he was a Paperclip scientist. Actually, make that a pre-Paperclip scientist as he was hustled in to America at the start of WW2 to conduct scientific research for the US Government long before Project Paperclip even existed. Schneider’s father went on to tell him that as an American scientist he was involved in the Philadelphia Experiment. He also told his son about other exotic and clandestine government projects that may have included early underground bases, although Schneider couldn’t be sure. Schneider said he was shocked his father revealed all this to him on his deathbed. By all accounts there wasn’t time to compare both of their experiences before Schneider Senior died. Whether Schneider’s father was in any way responsible for the top-secret military clearance levels his son attained or indeed whether Philip Schneider’s own claims about working in underground bases are true, remain pure speculation and will probably never be proven or disproven. As one would expect, without undeniable evidence or absolute proof left behind to confirm Schneider’s story, there are as many skeptics as believers. The former include some who insist they’ve debunked all his claims about underground bases and ET’s. On the other hand, it could reasonably be argued undeniable evidence is exceedingly difficult to obtain when it comes to proving the Splinter Civilization exists and is in our midst. “The North Atlantic seems to be very significant and is possibly the largest sea base in European waters. Other reported underwater bases are in South America waters – in the areas of Puerto Rico and Brazil – in Antarctica and other deep unobserved areas of ocean.” –Tony Dodd. Former British police officer. Could there also be secret military facilities under our ocean floors? In 1969, the Stanford Research Institute in Menlo Park, California, published a report titled The Feasibility of manned in-bottom bases. The report states, “The construction of thirty in-bottom bases within the ocean floors is technically and economically feasible … The cost of such a base program would be about $2.7 billion”. Now keep in mind that was in 1969. So given the multi-trillion dollar black budgets numerous researchers claim the US Government and its agencies have access to annually, who is to say undersea bases weren’t financed and built as long ago as the 1970’s? Interestingly, the Stanford Research Institute’s 1969 report also states that deep submergence vehicles would need to be developed to build undersea bases. The following year it was announced Lockheed had launched deep sea vehicles with the necessary capabilities to do just that. According to a lecture that independent researcher Dr. Richard Sauder gave at the Xcon 2004 conference, there could easily be US-built undersea bases in the Persian Gulf, the North Sea and the Gulf of Mexico. Dr. Sauder, author of the 1996 book Underground Bases and Tunnels: What is the Government Trying to Hide?, also spoke of the US Navy’s undersea test and research center off the coast of Andros Island, in the Bahamas. He speculated that the facility, which is known as AUTEC (Atlantic Undersea Test and Evaluation Centre), could be a front for an undersea complex of secret bases. On May 1, 2008, UK newspaper The Telegraph ran an article about China’s underwater sea bases. 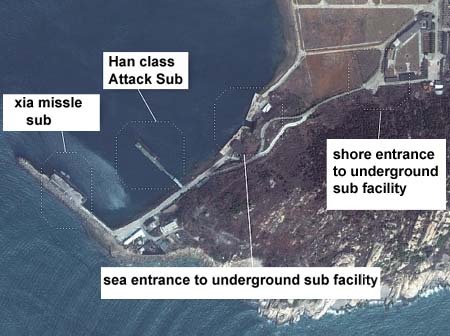 The article, which contained satellite imagery of base openings on Hainan Island, China, states there’s “a network of underground tunnels at the Sanya base on the southern tip of Hainan island”. The article also states that the tunnels allow Chinese submarines to travel out into the ocean from the base completely undetected. “Of even greater concern to the Pentagon,” the article continues, “are massive tunnel entrances, estimated to be 60ft high, built into hillsides around the base … While it has been known that China might be developing an underground base at Sanya, the pictures provide the first proof of the base’s existence and the rapid progress made”. Satellite image of Sanya, in the South China Sea. 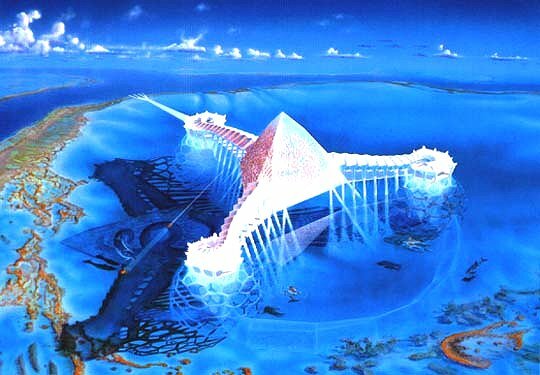 Although likely to be more complex and costly to build than bases beneath land, undersea bases would obviously provide even more secure hideaways for the Splinter Civilization to go about their business. It’s unlikely China and the US would be the only countries building undersea bases for their naval advancements and other purposes. We’d be remiss not to add that a few conspiracy theorists – most likely of the Tinfoil Hat variety – believe that senior Nazis built an undersea colony beneath Antarctica and even lived there after WW2 ended. This base was supposedly at or off the coast of New Swabia, which was explored and claimed as a territory by Germany just before WW2 – in early 1939. The Antarctic region was named after that expedition’s ship, the Ms Schwabenland. However, the region’s official exploration is where the facts end and the (possibly lunatic) theories begin. One such theory insists that hundreds of Nazi flying saucers were stored in the New Swabia undersea colony. Not only that but a secret nuclear war occurred there in the late 1980’s between the US and the surviving Nazis, causing the ozone hole over the South Pole and “false” global warming issues! Even the South Pole can’t escape the Tinfoil Hatters! You gotta love the Tinfoil Hat Network. What they lack in anything resembling evidence, they make up in spades for with blockbuster-style entertainment. Admittedly, we have no idea how many of these undersea and underground bases are real and how many are pure fiction. Nor do we know the extent of activity in the known subterranean bases or whether ET’s are present. Anyone desperate enough to learn the truth could approach scientists, engineers and military personnel who have worked at confirmed underground bases and try to prize information out of them. Truthseekers could also go to areas where subterranean bases are rumored to exist and use ground penetrating radar devices to see if manmade levels, structures and machinery show up below. 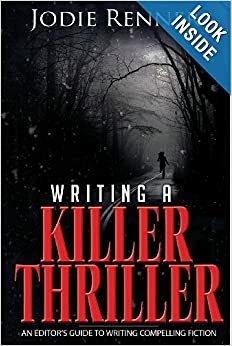 However, anyone considering such action should probably keep in mind that the line between independent investigator and conspiracy crackpot is often a thin one…Actually, maybe we should have kept that in mind ourselves before we agreed to write this book! 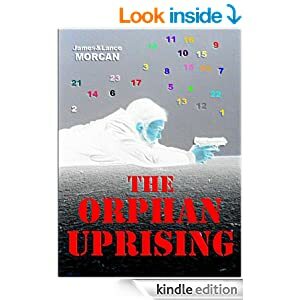 “The secret history of the 20th Century and the early 21st Century.” – That’s how Dr. Takaaki Musha, a former senior research scientist at the Technical Research and Development Institute of Japan’s Ministry of Defense, describes our new release book, The Orphan Conspiracies: 29 Conspiracy Theories from The Orphan Trilogy. Book bridges gap between fiction and fact. 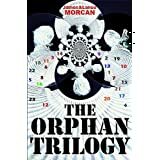 As the title of our new book suggests, The Orphan Conspiracies examines 29 conspiracy theories highlighted in our top rating international thriller series, The Orphan Trilogy. It fully explores the real-world suppositions, assumptions and theories we included in our fictional series and provides answers to the questions our readers have been asking. 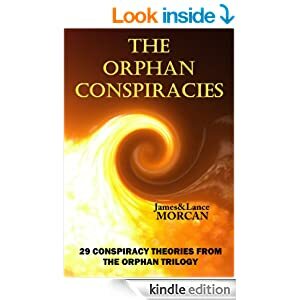 Over the coming weeks, starting today with Dr. Musha’s Foreword, we will feature excerpts from The Orphan Conspiracies: 29 Conspiracy Theories from The Orphan Trilogy. Conspiracy theories explored range from false flag operations, international banksters, genius techniques of the elite and suppressed science to the Queen’s invisible riches, the Medical Industrial Complex and real-life Manchurian Candidates. Currently, the world is in a desperate state due to environmental pollution, depletion of natural resources and food supplies, and economic inequalities. To solve these problems and to reach the next level of Mankind, a “new innovation of technology” is required. But nowadays innovative technologies such as cold fusion, and radical energy sources, including sonoluminescent-triggered fusionand anti-gravitational propulsion, are either being withheld or blocked by governments, old-fashioned science academia and multinational corporations. I expect readers of this book will be surprised by the level of knowledge imparted in its pages especially with its revelations of exotic technologies, financial injustices, political deceptions and suppressed scientific discoveries. I also expect readers will be inspired by the lifting of the veil that occurs when long-guarded information is absorbed. -Dr. Takaaki Musha, Director of the Advanced-Science Technology Research Organization (Japan) / Editor-in-Chief, Journal of Space Exploration (Mehta Press) / Former senior research scientist at the Technical Research and Development Institute of the Ministry of Defense, Japan.